Sold by Boomoo and Fulfilled by Amazon. Gift-wrap available. 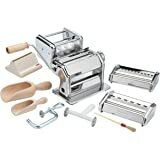 Amazon's Choice for "pasta maker"
Sold by Boomoo and ships from Amazon Fulfillment. 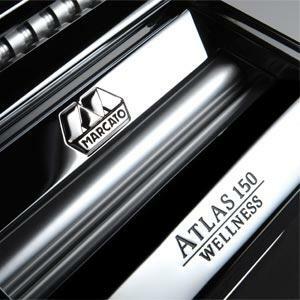 The tradition of quality, function and design continues with Marcato. 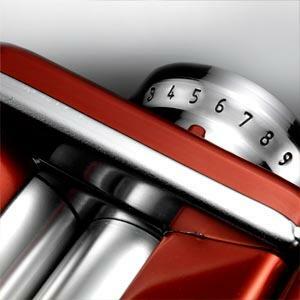 Quality, function and aesthetic style are complemented with a love for tradition and an eye for technical innovation. 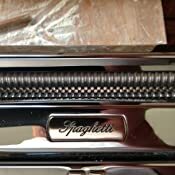 Easily make lasagna, fettuccine and taglioni. 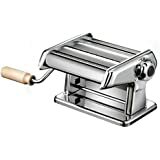 The rough surface of the rollers results in a porous pasta that absorbs the sauce. 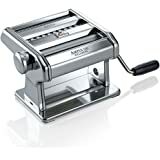 Handle allows for easy processing of the dough; adjustable to 10 positions means you can choose thickness of the pasta. 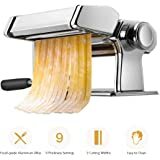 13 Add-on accessories for creating pasta of different thickness, cuts and shapes. 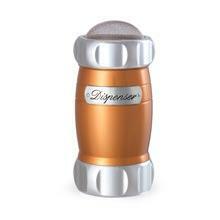 Ergonomic shape for all types of flour, powdered or granulated sugar, powdered cocoa and cinnamon. Easy to clean. A little dough in a lot of space. 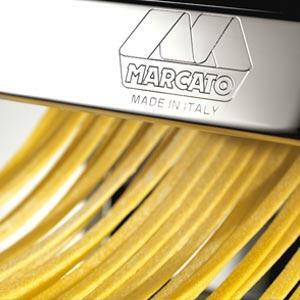 The fan-like opening, takes up little space and 16 removable arms for easy transport of pasta. 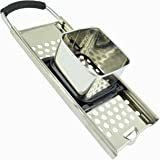 Holds 2 kg of pasta. 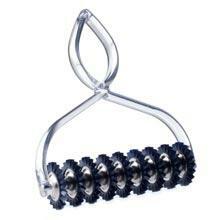 Equipped with 9 interchangeable wheels, easy to pull out and slide in. Cut sweet and salty pasta sheets into zigzag shapes. 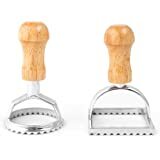 Made of anodized aluminum alloy, provides for stability during cutting; comes with rolling pin. First a sellers note: They sent me this broken. 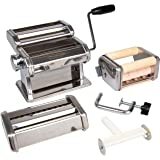 The ring bearing on the fettuccine roller was detached and clanging inside the machine. 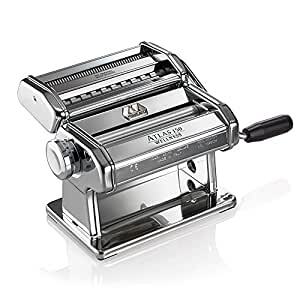 I didn't know that when I first used the machine, when I tried to roll pasta through the fettuccine part of the machine and it didn't roll, I just thought I didn't know how to use the machine well enough. 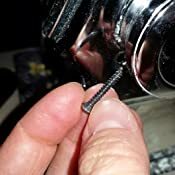 Fortunately, I was able to unscrew the machine, get to that part, and fix it. After my first use of this machine I was ready to give it away and buy an attachment for my Kitchen aid. 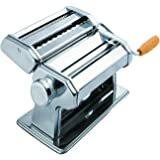 It was my first time ever making homemade pasta so I had zero experience with pasta dough, or this pasta maker. The whole experience was daunting. Rolling the pasta dough was awkward, and the noodles I did get out were sticking together and not at all beautiful. 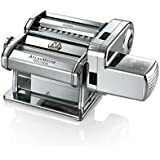 Recently I started researching attachments and gadgets to replace the Atlas. I read so many reviews and a lot of them gave suggestions about the pasta dough. I decided to give my Atlas one more try. This time I focused on the dough. I weighed the ingredients (10oz flour, eggs-2 whole eggs weighing 4.0 oz and 4 yolks 2.5 oz) to make sure I was precise, and this time rather than add water because the dough appeared dry, I kneaded the dough by hand until all the ingredients came together. Trust me on this: My dough seemed to be way too dry. But I kneaded through my doubts without adding anymore water and the dough came together perfectly. After letting the dough rest for about an hour, the dough was smooth perfection! I couldn't believe it! I set up the Atlas this time I anchored it to my counter top (I didn't do that the first time), and then began rolling the dough 3 times on each setting starting with 0 and ending with 6! The rolled sheets were a thing of beauty! I couldn't believe how different the entire experience was. Rolling was daunting the first time I tried it on this machine, but with the right dough, it was easy and effortless. 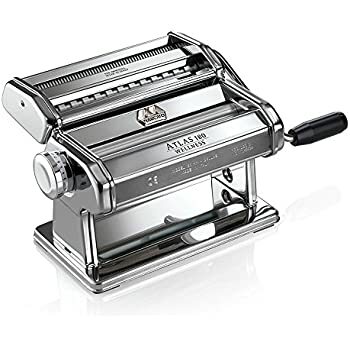 In fact, I remember thinking the first time I used the Atlas that I needed three hands to even make rolling pasta comfortable. 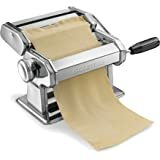 But this time, it was so easy and smooth, I rolled and passed the rolled sheets through the fettuccine and spaghetti rollers in less than 30 minutes. Two hands were more than enough. 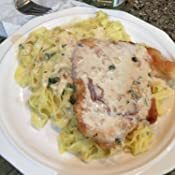 The pasta turned out beautiful and delicious! 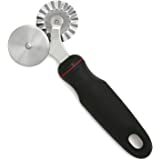 I'm still going to buy the 3 piece Kitchen aid roller attachments, but only because I think it will speed up the process. But truth be told, if time were not a commodity in my home, the Atlas is really all I would need. If you start with a good dough, the machine really does all the rest. Clean up is easy with a perfect dough nothing sticks to the machine. 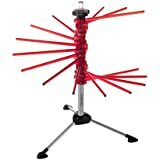 I love this machine, I've used it 3 times this week alone! In fact a friend of mine came over for dinner last night and after having the pasta that I hand rolled on this machine she begged me to host a pasta making party with her, her 4yr old daughter, and my 4yr old, so I am. I have no doubt that our girls will be able to roll the dough on this machine. Awesome solid sturdy machine! Excellent family activity! 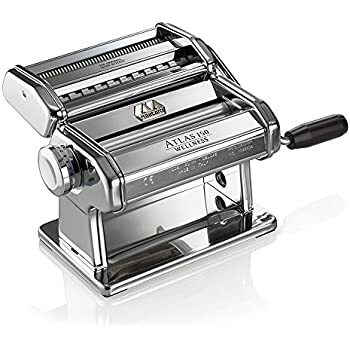 I already own a ravioli tray press, but this machine is WAY better! The learning curve was a little steep, but patience won out. I failed twice, but learned once. It turned out that my sheets were too thick and too dry. 1. The dough should rest for at least 30 minutes at room temperature before working. 2. Final roller setting should be thin. For ravioli I stop at #7, but it depends on your flour, and whether you are using water or egg base. I use egg base. 3. The sheet should be JUST dry enough not to stick to the rollers. Too dry and it will burst out when filling. 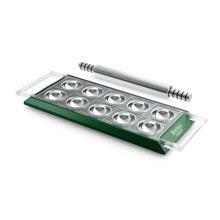 The sheet needs to be able to "stretch" as it goes through the filling rollers. To check for stretchy, I developed the "knuckle test". Lay the rolled sheet over the back of your fist. If the sheet forms itself nicely over your knuckles, it's soft enough to run through the filler. 4. Dust the "ROLLER SIDE ONLY" of the sheet as you fill. If you dust the filling side, the sheet can't grab the filling material, and you end up with unfilled crimped pasta. 5. Don't use lumpy or dry filling. The closer the filling is to a purée, the better it will fill. And yes, the plastic rollers and the filler fence can be wet washed, but DO NOT SUBMERSE the metal housing! The drive mechanism could rust, killing the unit. Overall, a great unit! It just takes a little time to figure it out. 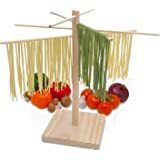 But then again, isn't that the best part of why we make home made pasta? Besides, what Deli offers fresh made Crabmeat filled Ravioli? 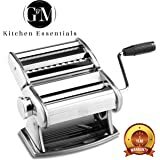 I purchased the pasta press in September 2017. After five uses the clamp failed. 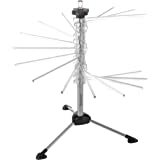 I contacted Marcato directly three times by their email address provided on their website and absolutely no response. I’ve been contacted Amazon who then just said that they would except a return on the item. 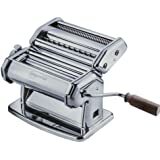 I looked to rebuy the same pasta press and now the costs more. As a matter of principle I simply don’t want to pay extra for an item that should never failed in the first place or out at the very least have a part replaced at no cost. 5.0 out of 5 starsThis Is Your Cadillac Remedy When You Can't Find It On The Grocer's Shelf Or If It's Too Expensive. 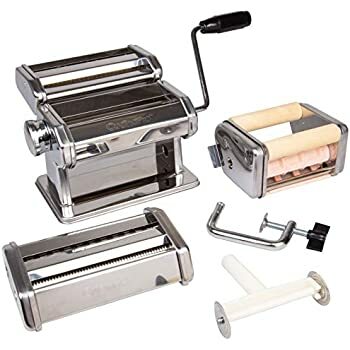 I purchased this pasta machine simply because I am Type II diabetic. Unbleached flour products such as wheat bread and pasta are better because they are unbleached and break down slower than white flour. 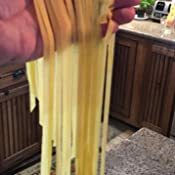 Finding unbleached wheat pasta products are sometimes hard to find or more expensive for whatever reason, organic or otherwise. The instruction manual comes in a wide variety of languages with the recipe amounts in grams. Simply looking for conversions and recipes on-line alleviates this issue. I had read this machine is considered to be the Cadillac of pasta machines and for me it is. I've had none of the problems I've seen others report with their reviews. The motion is smooth and quiet. The rollers close evenly for an equal flatness of the dough. 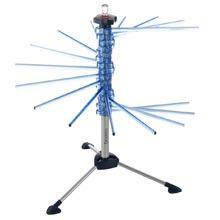 I did not purchase a model with the electric motor. Hand cranking is fine for me. I use a 2" wide, 12" ruler for a lasagna noodle template and cut them with a pizza cutter. 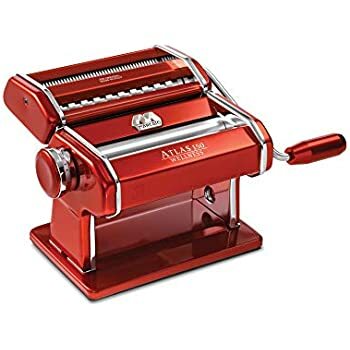 Works like a champ in making spinach and other vegetable pasta's. Just flour dust up the rollers & pasta a little. 5.0 out of 5 starsQuality. Period. This is QUALITY. Don’t order ANY other matchine. We made 6 different types of ravioli our first night with the Bellemain Large Ravioli Maker that we also purchased. Then we cut Tag and Fett noodles with the scraps that were left over. ZERO clean up issues. Just wipe clean with a towel. Used 3 cups flower and 4 eggs and 1 T oil for our dough. Start at Zero and run it all through a couple times on each setting and keep folding it over and cut when too long. Work as a team for best results. Try not to drink too much wine or you will lose your focus! :-). So happy that I bought the best right out of the gate. Lots of research paid off!